Atlas of the Future’s storytelling project #CultureFutures is mapping creative and cultural projects with a social mission. Dig deep into the joyful world of virtual reality, comic book artists, filmmakers, photographers, illustrators and collectives who help build a better, and more imaginative, world – in all its technicoloured glory. 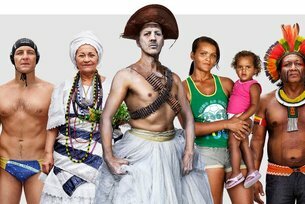 British artist Marcus Lyon uses portraiture, oral histories, multi-layered exploration and DNA analysis to reveal the beauty and diversity of identities in Brazil, Germany and Detroit. Liz Corbin created Materiom to collectively open source recipes from nature for a more sustainable materials and design future. Enter the culinary world of the circular design expert. Dan Baron Cohen has spent 20+ years co-creating youth-led collectives in the Amazon to transform lives through creative performance and production, remaking and protecting the founding community of the region. With Little Inventors, Dominic Wilcox brings crayon drawings to life as real gadgets – inspiring kids to keep believing that the only real limit is their imagination. Gerald Lidstone, Director of the Institute for Creative and Cultural Entrepreneurship at Goldsmiths. Giulia Crossley, Marketing Manager, Creative Economy and Cultural Skills, British Council.